VisTech.Projects: Pupil Distance Measure for iOS. Important tips and update. How to measure pupillary distance properly. 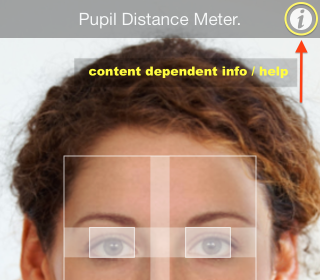 Pupil Distance Measure for iOS. Important tips and update. How to measure pupillary distance properly. New update v1.0.3 for the iOS version of Pupil Distance Meter has been released. We have made some improvements to the measurement process and also included important information on the screen during the measurement procedure. It should help to understand key point for the successful and accurate measurements. The info button at the upper right corner of the screen provides content-dependent info / help. It means the information shown on touch is related to the current measurement step or state of the app. Thus you can see help tips at each step of the measurement procedure. - taking two SUCCESSIVE pictures of a face with a reference (e.g. credit card) automatically during one session. 3 sec interval allowed to move the camera from the face to fit a new pattern scale. ONLY after the rulers are properly aligned and confirmed for BOTH pictures - the actual measurement results are shown at the top of screen. we still see that some users have difficulties with understanding the measurement procedure and it causes improper results. - DO NOT MOVE OR TILT OR SHIFT YOUR HEAD AND REFERENCE (!) while taking two successive picture. It is VERY important that pictures are taken for the same head and card position (!). ONLY PART YOU CAN MOVE between taking 1st and 2nd pictures is YOUR DEVICE. We hope this info can help you to understand the measurement procedure better and improve your experience with the Pupil Distance Meter app that is designed to provide accurate PD measurement. If you have questions or suggestions please contact support@vistechprojects.com, we will be glad to help you.